I live in Manhattan. It has its ups and downs, but overall it's petty cool. There's new construction going up everywhere but those tend to be luxury, state-of-the-art, high-falutin places. IOW: Very expensive. So the place I live was built roughly 50 years ago and as with any aging infrastructure it needs upkeep. About two months ago they started repointing the brick facade of my building which normally means replacing the outtermost inch or so of mortar with new mortar to keep water out. Unfortunately the corner and floor where I live happens to have such severe damage that they're replacing entire swaths (we're talking 50sq ft areas at a time) of brick but the good news is that they're putting a waterproof lining behind the new brick. Unfortunately that lining requires adhesive and the smell from it is horrific - it's like a vicious cross between paint thinner, nail polish remover and gear oil. How do I know? It has intruded into our apartment every day since but it's strongest between 8pm and midnight. The engineer swears it's not possible, but he's been there several times and he can smell it. The Superintendent can't figure it out and neither can anyone else. Worst of all it's strongest in my 20-month old daughter's room and the last thing I want is a toddler's brain subject to random industrial chemicals. I know, I know - I'm a helicopter Dad. Sue me. But every night we have to wheel her crib into a different room, basically chasing the fresh air. She doesn't sleep as well, we don't sleep as well and who knows what it's doing to her. We've been after everyone possible to send us the material safety data sheets on what they're using and finally, after six weeks, we got them today. I spent most of my afternoon reading documents published by the NIH, EPA and other government agencies chartered to protect us from this crap. Score one for the nanny state. To add insult to injury the picture you're looking at is a foot of 3/4" steel rebar poking through the wall of my living room. (Look in the corner and you'll see another hole). I had two more like it, both of which intruded into my daughter's play area, at about 12" off the ground: RIGHT WHERE SHE SITS AND PLAYS. 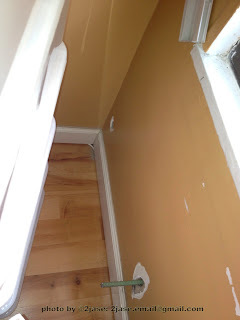 The workers "happened to misjudge" the reinforcement point by almost two feet and they drilled into our apartment rather than between floors. And they did it four times! I don't even want to think about what would have happened if a child had been sitting against the wall when one of those came through. Unfortunately no one involved has been able to fix any of this and we've had enough. We're calling in our uncle. If the odor comes back tonight we're calling 311 to report chemical fumes and from what a friend tells me about his experience we'll have people in respirators carrying chemical detectors in our apartment within 24 hours. Even better if the building management can't or won't fix the problem the government will. "No, not my tax dollars!" I hear you cry. Be quiet. They bill the management company. So on one side we have big business possibly poisoning us, trying to stab us and refusing to fix their mistakes. And on the other we have the government who requires that companies supply their customers with safety information and who makes tons of details available about those chemicals. We also potentially have government coming to our rescue to make sure that bad things get fixed and forcing the guilty parties to pay for it. Tell me again that government can't do anything right and watch me laugh. Score one for the little guy and for big government. The whole damned situation is absurd.